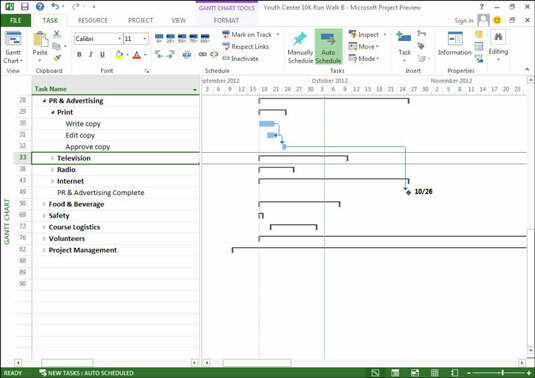 You can establish four types of dependency links in Project 2013: finish-to-start, start-to-start, finish-to-finish, and start-to-finish. Using these types efficiently can mean the difference between a project that finishes on time and one that’s still limping along long after you retire. Finish-to-start: This most common type of dependency link accounts for more than 90 percent of the dependencies you create in Project 2013. In this relationship, the predecessor task must be completed before the successor task can start. When you create a dependency, the default setting is finish-to-start. An example of a finish-to-start dependency is when you must complete the Develop Database task in Project 2013 before you can begin the Test Database task. The relationship is indicated by a successor task bar that starts where the predecessor task bar leaves off. You see the finish-to-start type abbreviated as FS. Start-to-start: The start of one task is dependent on the start of another. In this dependency type, two tasks can start simultaneously, or one task might have to start before another task can start. For example, assuming that you have the resources, you can start collecting requirements for payment and confirmation at the same time. A start-to-start relationship is abbreviated as SS. Finish-to-finish: In a finish-to-finish relationship, one task (you guessed it) must finish before or at the same time as another task. Suppose that you’re developing copy for print advertising. You know that the copy will require several rounds of writing and editing. Rather than show a Write→Edit→Write→Edit→Write→Edit set of tasks, you can show Write and Edit in a finish-to-finish relationship in which editing finishes at the same time as, or after, writing is done. Start-to-finish: In a start-to-finish dependency, the predecessor task can finish only after the successor task has started. If the successor is delayed, the predecessor task can’t finish. Of course, this type of relationship is abbreviated as SF. Suppose that you’re bringing online a new accounting application. The predecessor task of Turn-Off Old Application can’t be completed before the successor task of Start Up New Application has started. You need to make sure the new application works as expected, even though you have tested it — run both for a month or so. Therefore, the demise of the old application is dependent on when the new application starts up. The start-to-finish dependency type is tricky. Leave this type of logic to the professional schedulers and try to find a different way to indicate the relationship between tasks. Often, simply breaking down the tasks and resequencing them accomplishes the same goal.